Spring promises brighter sunshine, warmer weather, and most importantly, new baby animals! Although Spring days might be sunny, temperatures can still drop pretty low in the evening, making it extra important to keep both adult and baby animals warm. 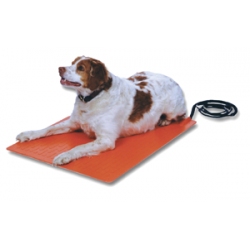 Osborne pet heating pads make it simple to keep your animals warm. Whether you have a few pets at home, several animals in a barn, or a whole zoo, heating pads can give you peace of mind, knowing that your animals are warm and comfortable, no matter how cold it gets outside. Spring is the perfect season to purchase animal heating pads for so many reasons. It is the season when baby animals are born, as well as the time of year when the weather is dampest. Warm-blooded animals can become ill from being too cold or wet, and cold-blooded creatures need a heat source to keep them warm, making it extremely important to give animals of all types a warm, dry place to sleep and care for their young. Osborne Stanfield® Heating Pads are ideal for so many different animal environments, so whether you have a barn filled with pigs, a house filled with puppies, or a large aquarium with iguanas, the numerous sizes and controls allow for you customize the heat settings to your animals’ needs. In the wild, animals get heat from each other, and from rocks, sand, and other natural features that absorb sunlight and hold heat. In a barn or inside a home there is much less sunlight, so it makes sense to provide the animals with an equally reliable source of heat that’s durable enough to withstand claws, hooves, teeth, moisture, and just about anything else. Featuring fiberglass-reinforced plastic, pet and pig heating pads offer a safe and economical way to promote good health, sustainable warmth, and unmatched comfort for your pet. Unlike a sun-warmed rock, heat pads distribute heat more evenly because they feature a heating element which is patterned to radiate warmth across the entire length of the pad, not just in one spot. The heating element is completely sealed in the pad, making it watertight and ideal for creatures who like the mud, aren’t yet housebroken, or even those looking for a warm place to nap after a swim. Your Animals Would Thank You if They Could! Caring for animals isn’t always easy. They can’t tell us what they need, but they always find ways to show us. Your animals won’t be able to thank you for adding a heating pad to their environment, but they’ll show you by spending time on it every day, enjoying the comfort of its thin, durable profile, feeding their babies on it, napping on it, and more. While your animals enjoy their new heating pad, you can enjoy the peace of mind that comes from knowing you’ve provided them with a high-quality product which was made right here in the USA. For more information about our heated dog pad outdoor or indoor warmth and safety, feel free to contact us today!